(Douay-Rheims) Who being the brightness of his glory, and the figure of his substance, and upholding all things by the word of his power, making purgation of sins, sitteth on the right hand of the majesty on high. Isn't being a "figure of" God's substance indicate that he did not actually "share" God's substance? "Who, being the radiance of his glory and the exact representation of his hypostasis,"
where the text translated as "the exact representation of his hypostasis" is "charaktēr tēs hypostaseōs autou". With this in mind, the short answer to the question is: translating hypostasis as substance would be perfect if we were translating Heb 1:3 into 1st century Latin, but after the Tertullian-initiated and Nicaea-confirmed understanding of substantia as ousía in the Nicene sense, it causes the passage to state either Arianism or tritheism. 1. Substantia is the original cognate of hypostasis. hypostasis = hypó ("under") + stásis ("a standing" = (hístēmi ("to stand") + -sis, verbal noun suffix)) = "that which stands under"
substantia = sub ("under") + stans ("standing", present active participle of stō ("stand")) = "that which stands under". According to , the first recorded use of hypostasis as "substance" was in the book "On the cause of plants" by Aristotle's successor Theophrastus (c. 371 - c. 287 BC), while the term may have been introduced in the philosophical discourse either by the Stoic Poseidonius (c. 135 BC - c. 51 BC) according to some, or by the Epicurean Demetrius Lacon (fl. late 2nd century BC) according to others, in both cases with the meaning of objective or concrete existence or reality. Thus, real entities were said to "have hypostasis", whereas merely apparent or imaginary entities did not. Recalling at this point that both the Stoic and the Epicurean philosophical schools were materialistic, the first conceiving the all-pervading Logos as a subtle fiery aether and the second conceiving reality as consisting just of atoms and void, it is clear that, to the extent that they used the term ousía, they would not have used it in the sense of form understood as universal or even in the sense of form at all, but in the sense of the individual, particular, concrete entity, the "hypokeimenon", “that which underlies or lies beneath”, which clearly overlaps with the meaning of hypostasis. Therefore, it is clear that for both Stoics and Epicureans the terms ousía and hypostasis were synonyms, but that was due to the specific sense in which both schools understood ousía. Since, per linguistic design, substantia = hypostasis, and, per Stoic and Epicurean understanding of ousía, hypostasis = ousía, then, for the Latin-speaking Stoic- and Epicurean-dominated culture, substantia = ousía, which was exactly what Tertullian did, as we will see below. 2. Heb 1:3 was written in a Stoic- and Epicurean-dominated lexical context. In order to understand correctly Heb 1:3, we must first take into account the lexical context of the human author at the time of writing it. As is well known, the Letter to the Hebrews was written before the destruction of the Second Temple in 70 AD, since it consistently refers to the sacrificial system of the Mosaic Law as still ongoing (Heb 8:4-5; 9:7-10,13,25; 10:1-2; 13:11). On the other hand, it was probably written shortly before 70 AD, since the exhortation to "Remember your leaders, those who spoke to you the word of God. Consider the outcome of their way of life, and imitate their faith." (Heb 13:7) seems to refer either to James, brother of the Lord, killed in Jerusalem in 62 AD, or to Peter and Paul, killed in Rome in 64 and 67 AD. Therefore, the Letter was written in a cultural context in which, for the last 150 years, the prevalent philosophical schools had been Stoicism and Epicureanism, both of which, as we saw in the previous section, used the term hypostasis with the meaning of objective or concrete existence or reality. Then we must note that the very notion of "charaktēr" - impressed image or copy of something, reproduction, representation  - necessarily implies a numerical distinction between the original and its charaktēr. Therefore, stating that the Son is "the charaktēr of the Father's hypostasis" necessarily implies that the Son is or has a numerically different hypostasis from that of the Father, irrespective of what hypostasis may mean in that context. Taking these two points in conjunction, Heb 1:3 is saying that the Son is the exact representation of the objective, concrete reality of the Father. Therefore, the objective, concrete reality of the Son is numerically different from that of the Father. 2.1. Is Heb 1:3 consistent with trinitarian orthodoxy, Arianism, tritheism, or all of them? The key to answer this question is to realize that, in orthodox trinitarian doctrine, the divine nature does not exist in reality separate from the divine Persons. I.e. the common divine nature, abstracted from and without the personal properties, does not have objective, concrete reality. (And thus, in the philosophical lexicon of 1st century AD, it does not "have hypostasis".) It is the Father, the Son and the Holy Spirit Who have objective, concrete reality. (And thus, in the philosophical lexicon of 1st century AD, "have hypostasis".) And since the Father is really not the Son, the objective, concrete reality of the Son (-his hypostasis in the philosophical lexicon of 1st century AD-) is numerically different from that of the Father, which is precisely the sense of Heb 1:3, as we saw above. Therefore, Heb 1:3 is consistent with trinitarian orthodoxy. Note that if in the framework of trinitarian orthodoxy we want to use the term hypostasis in a sense consistent with Heb 1:3, we must use it in the post-Cappadocian sense (as opposed to the Nicene sense of synonym of ousía), because, as we saw above, Heb 1:3 necessarily implies that the Son is or has a numerically different hypostasis from that of the Father, irrespective of what hypostasis may mean. Thus, the definition of Nicaea did not use hypostasis in a sense consistent with Heb 1:3. Clearly Heb 1:3 is also consistent with Arianism and tritheism, which also posit that the objective, concrete reality of the Son is numerically different from that of the Father. The only inconsistency of Heb 1:3 is with modalism. 2.2. What is the correct translation of hypostasis in Heb 1:3? As we will see, the choice of Latin-derived words for "his hypostasis" to convey the original sense of "the objective, concrete reality of the Father" can no longer, after the trinitarian debates of the IV century and the settlement of the theological lexicon, be made independently from the adoption of a particular theological position. This is because, as we saw above, Heb 1:3 necessarily implies that the Son is or has a numerically different hypostasis from that of the Father, irrespective of what hypostasis may mean. With this "charaktēr corollary" in mind, let's examine the options for translating hypostasis. a. Substance. While "substantia" in the 1st century AD was etymologically and semantically equivalent to "hypostasis", after Tertullian coined the formula "tres Personae, una Substantia" early in the III century, substantia came to mean, among Latin-speaking Christians, the single infinite spirit that the Father, the Son and the Holy Spirit have in common. This meaning of substantia as equivalent to ousía in the Nicene sense was reinforced by that Council establishing that hypostasis, the cognate and original equivalent of substantia, was to be understood as synonym of ousía. Therefore, translating hypostasis in Heb 1:3 as "substance" after Nicaea has as a consequence, per the "charaktēr corollary" recalled above, that the translated text necessarily implies that the Son has a numerically different substance, i.e. ousía in the Nicene sense, from that of the Father, which amounts to stating Arianism if the substances are qualitatively different or tritheism if they are qualitatively identical. In other words, translating hypostasis as substance would be perfect if we were translating Heb 1:3 into 1st century Latin, but after the Tertullian-initiated and Nicaea-confirmed understanding of substantia as ousía in the Nicene sense, it causes the passage to state either Arianism or tritheism. b. Being. This term is ambiguous, and in principle could convey the original sense of "objective, concrete reality" as either post-Nicene notion, ousía or Person, though it sounds more like the former, with which it is etymologically related. Therefore, it is in principle compatible with all theological positions, though it sounds more as Arian or tritheistic. c. Person. This term is fully consistent with trinitarian orthodoxy (and also with the other theological positions, since it says nothing about whether the Father and the Son have the same ousía.) It has two drawbacks: first, it has no etymological relation with hypostasis, and second, it is not a general equivalent to hypostasis but only to a hypostasis of a personal nature. subsistentia = sub ("under") + sistēns ("standing", present active participle of sistō ("stand")) = "that which stands under". Therefore translating hypostasis as subsistence is etymologically perfect, generally valid, and fully consistent with trinitarian orthodoxy (and also with the other theological positions, just as the case of person). The drawback is that the word has a completely unrelated usual meaning in English. – But the ["the Son ‘Who is the image of the invisible God’ (Col. 1:15)" is the] figure of what? Of his nature [substance]. [Substantiæ eius.] For there are many images of things: sometimes it is a sign representing the species but yet not agreeing with it in any way; as the image of a man on canvas, which in no sense possesses the true species of man. Sometimes it is similar to it in species not only in representing, but even in being, as the Son is the true image of His Father: ‘Adam begot a son in his own image’ (Gen. 5:3), i.e., in the nature of his species. Therefore, the Apostle adds [the phrase] "of his substance" [substantiæ eius], because according to Augustine a son is called the image of the father, because he is of the same nature as he. He says, therefore, that he is the figure of his nature [substance]. – But why does he not say that He is the figure of His nature [naturæ]? Because it is possible for the nature of a species to be multiplied according to the multitude of individuals composed of matter and form. Hence, the son of Socrates does not have the same numerical nature has his father. But the substance is never multiplied; for the substance of the father is not distinct from the substance of the son: for substance is not divided according to diverse individuals. Therefore, because there is one and the same numerical nature in the Father and in the Son of God, he does not say ‘the figure of His nature’, but "of his substance" [substantiæ eius], which is indivisible: ‘I and the Father are one’ (Jn. 10:30); ‘I in the Father and the Father in me’ (Jn. 14:10). Since the Persons of the Holy Trinity do not grow, it is more proper to use the term "substance" than "nature". Not the answer you're looking for? 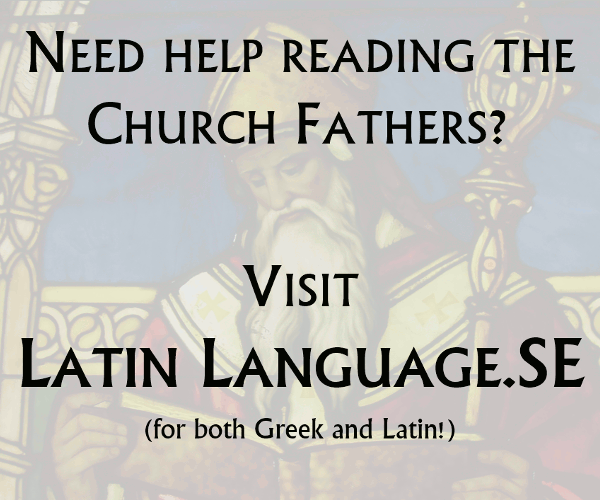 Browse other questions tagged catholicism exegesis christology hebrews latin-vulgate or ask your own question. How do you reconcile Hebrews 9:27 with Elijah and Enoch?